Dog Ears, the popular children’s reading therapy program offered through Mesa County Libraries, is coming to the Palisade Branch in 2019. Registered therapy dogs will visit the Palisade Branch, 119 W. Third St., at 4 p.m. on the first Friday of each month, beginning Jan. 4. 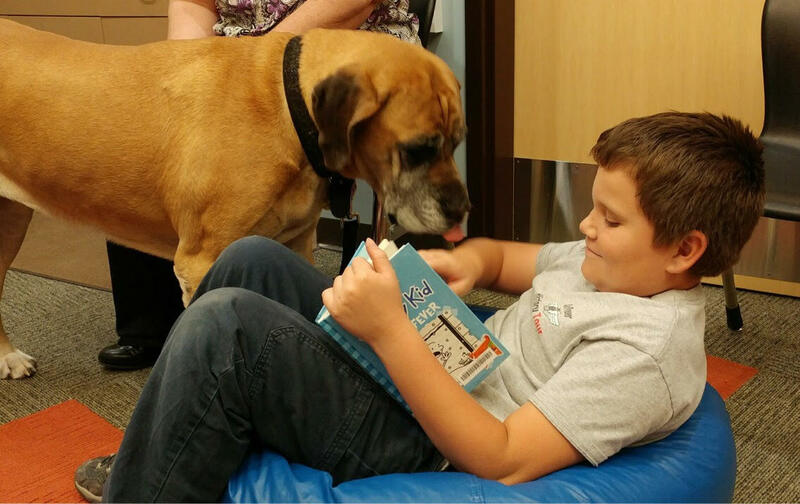 Kids can sign up in advance for a 15-minute time slot during which they can read to a dog, uninterrupted. The program gives learning readers and reluctant readers the opportunity to enjoy reading in a non-judgmental situation, which often helps improve their reading confidence and enjoyment. One more change to the program also happens in January: Dog Ears at the Fruita Branch will start at 3 p.m. on the second Wednesday of the month. The Dog Ears program, which has been at Mesa County Libraries for about five years, has grown steadily and, with the addition of the Palisade Branch, will be offered at six library locations throughout the county. Space and time slots are limited at each location, and participants are required to sign up in advance. Parents can sign up their children either in person at a participating branch of their choice or by calling Mesa County Libraries at 970-243-4442. There is no charge to participate in Dog Ears. Central Library, 443 N. 6th St., Grand Junction: 4 p.m. on the first Wednesday of the month (Jan. 2). Palisade Branch, 119 W. Third St.: 4 p.m. on the first Friday of the month (Jan. 4). Fruita Branch, 324 N. Coulson St.: 3 p.m. on the second Wednesday of the month (Jan. 9). Clifton Branch, 590 32 Road: 3 p.m. on the third Wednesday of the month (Jan. 16). Collbran Branch, 111 Main St.: 11:30 a.m. on the third Friday of the month (Jan. 18). Orchard Mesa Branch, 230 Lynwood St.: 4 p.m. on the fourth Wednesday of the month (Jan. 23). Posted in Branches, General, Kids, Library News, Literacy, Programs/Classes, Teens.